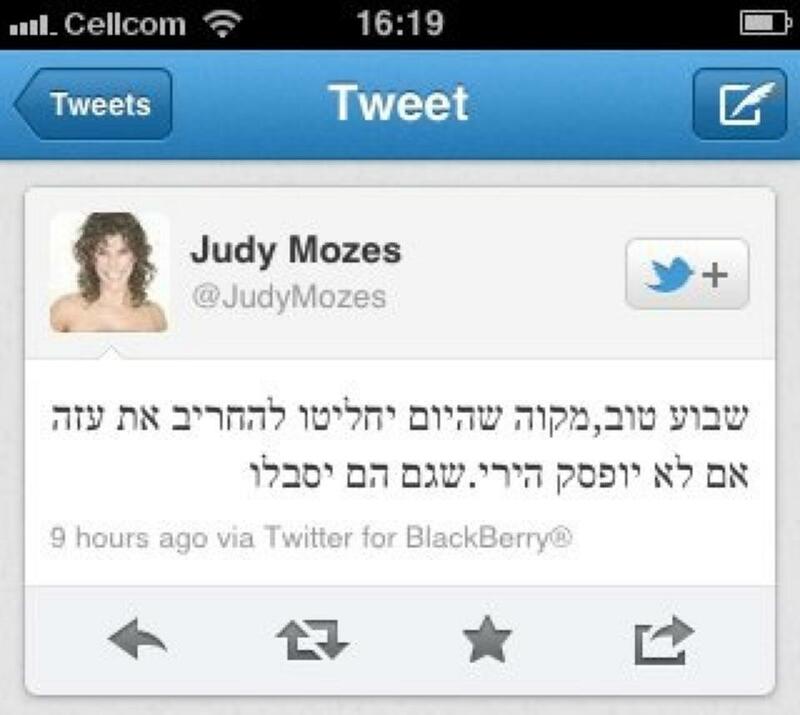 Wife of vice prime minister of Israel suggests kidnapping of the entire population of Gaza children.Yes you heard it right Judy Mozes has suggested “I think we should allow all children to leave Gaza, take them to get to know our children and show them that despite what is instilled in them we are a truly remarkable”. The question is remarkable for what???? Surely not their remarkable reputation for “humanitarianism” or “democracy”. How for example is she going to explain the cattle gates at the Qalandia Checkpoint and the apartheid Wall and Jew only roads. Perhaps she si going to explain Israels truly remarkable ability to Attack some of their friends from the air as they walk to school????? Perhaps Judy thinks a fashion parade staring herself will show them how truly remarkable she is?? I am not one to gossip oh hell I will anyway…. Judy is not known for her ability to think before she makes herself look like a fool…. take a look at this tweet about the Katsav affair. I mean really what else can one say? Ps Have you heard the joke about the Tel Aviv whore standing under a lamp post? If it look like a duck , walks like a duck. talks like a duck it is a ……………………………. Golan הבורות והפחד הם האסון שלנו. מהם נובעות הגזענות והאלימות וראיית האחר כ"אויב" שיש להשמידו, וחוסר ההבנה שסבל גורם סבל, אלימות מביאה לעוד אלימות, ובמלחמה אין באמת מנצחים - רק קורבנות. עצוב. As with the first Humanitarian flotilla to Gaza, Israel has been preparing for a murderous attack to stop them reaching their chosen destination.Greta Berlin one of the Flotilla organizers had this posted on her Facebook wall.